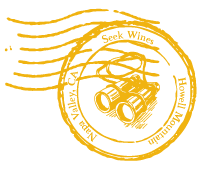 Seek Wines | Is that a Science Lab? Is that a Science Lab? Or is it an art lab? 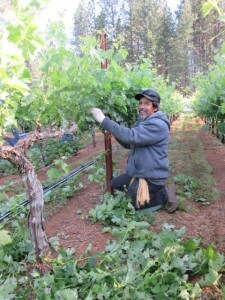 Meet Bob Bolan, the winemaker that makes our Cabernet Sauvignon. 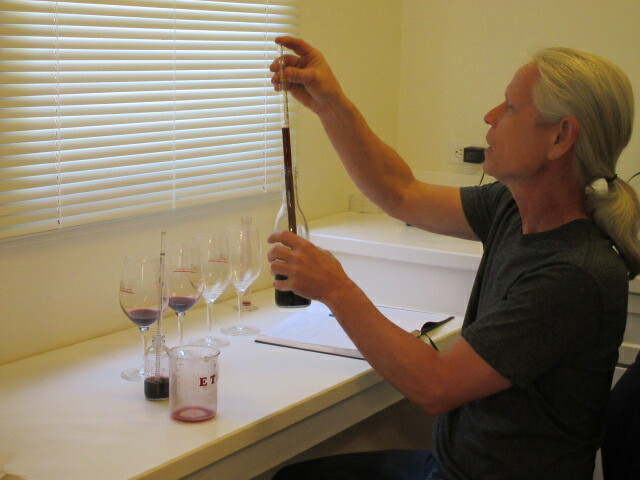 Bob is conducting blending trials now for several wines he’s making, including our 2014 vintage, that will be bottled in August. 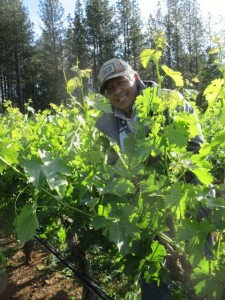 Bob usually blends very small percentages of at least 2 other wines into our Cabernet Sauvignon. Blending is intended to create wines with balanced flavors, acidity, alcohol, and tannins as well as a pleasant mouth feel and long finish. Bob’s trick is to prepare one glass of wine in the lab that represents the best combination of those characteristics for every wine he makes. So visualize Bob sitting alone in his lab for hours and blending a little of this and a little of that, meticulously recording in his notebook exactly what’s in each blend using a graduated cylinder and pipette so he can duplicate it in a large lot, and sipping until he exclaims “Eureka!” Bob says he doesn’t swallow the wine during blending trials because it would be too intoxicating. And Bill Clinton didn’t inhale. Whatever you say Bob. Meanwhile back at the ranch …You may have noticed our work isn’t as fun as Bob’s. The weather in May and June has seesawed between spring and summer. 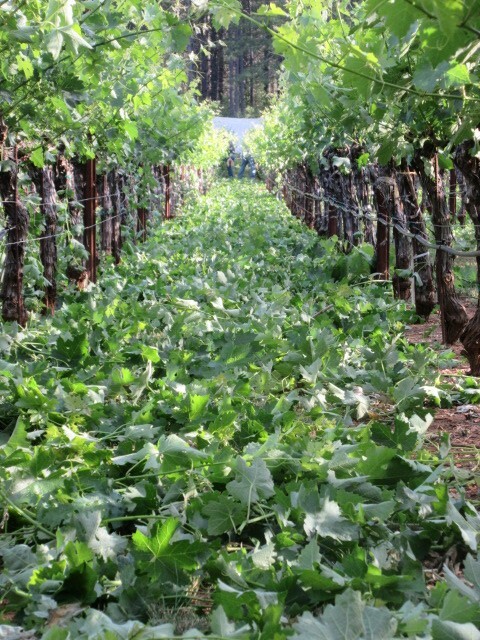 In 3 of 6 weeks we had a 20+ degree change in 24 hours.Gerry kept the cover crop between each vineyard row mowed to enhance the effectiveness of our frost exhausting machine. 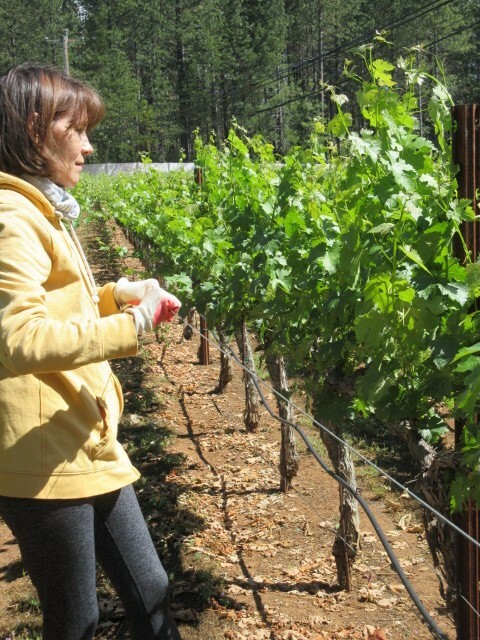 The machine ran about 6 nights, including May 15 and 16 when the temperature fell to 33, but the vineyard avoided frost damage. On the last mow of the season, Gerry got his flail mower into a wire fight. The wire scored a swift and mower-stopping victory. He didn’t see the wire attached to a fence post stacked on the edge of the vineyard. 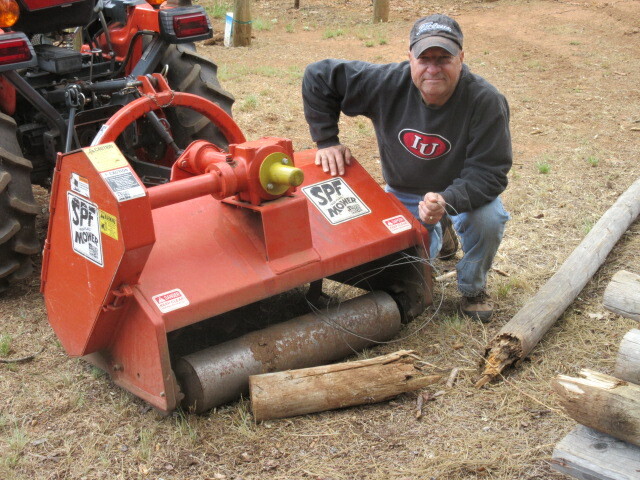 When Gerry backed the mower up to the posts, the mower sucked in the fence post, snapped it in two as if it were a pencil, and swallowed about 4 feet of wire. The mechanic who came on site had to disassemble the mower to get the wire out. He told Gerry it happens all the time. Smart mechanic. Always make the customer feel good, even when he does something stupid. Even our visiting children have to work for their meals. 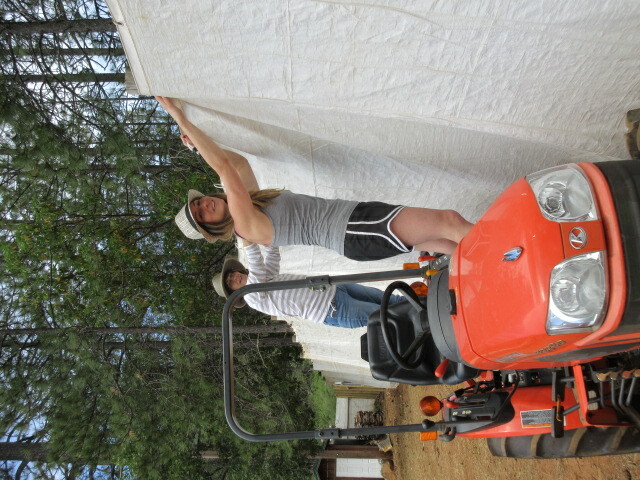 She and Barb are using the tractor as a mobile platform to remove the frost tarps we hung on the perimeter of the vineyard when it was pruned in March. Bridget didn’t work too long or hard before she declared break time. These 2 can’t be left unsupervised for long. 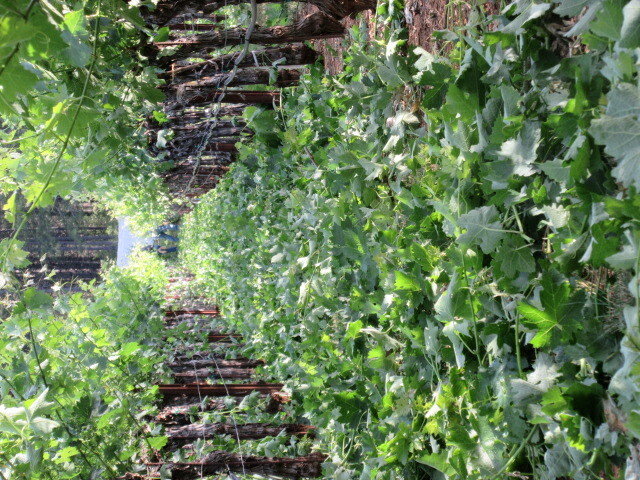 Each year the vineyard has to be suckered about 2 months after it’s pruned. 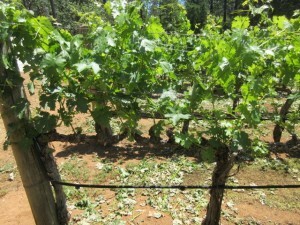 We want each vine to grow only about 16 shoots (or canes) on the cordon (the arms of the vine). 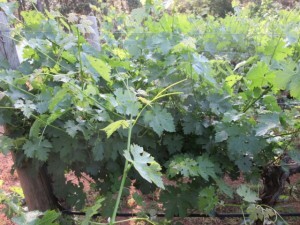 Each shoot grows 2 grape clusters. 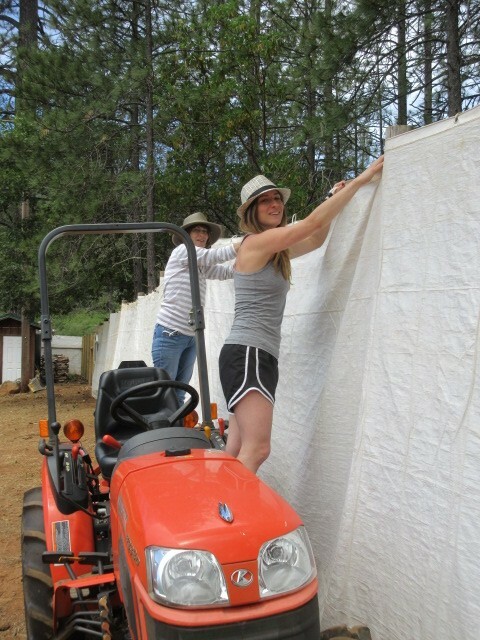 All the undesirable shoots must be removed by hand to give the grape clusters sun exposure, air circulation, and room to develop. The accompanying photos show the same vine before and after suckering. They were part of a crew of 8 who left many suckers in their wake over just 3 days. The remaining canes must be tucked between the four training wires. You see Barb tucking the canes inside the wires. 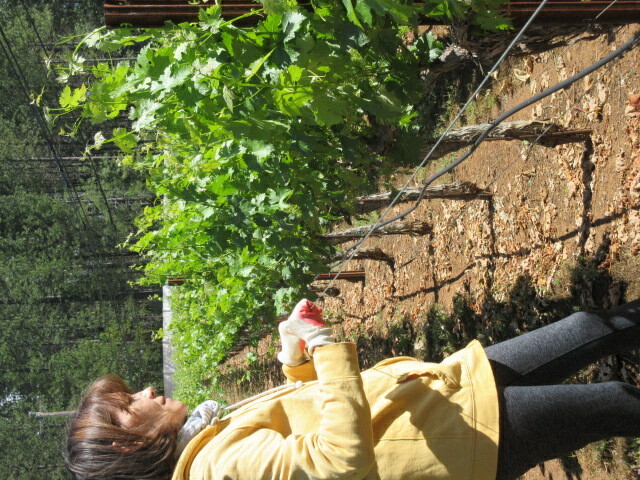 We do this by raising the training wires that we dropped below the cordons before pruning. Raising the wires to the desired levels and connecting them to the stakes allows us to tuck hundreds of canes simultaneously and reduces the risk of breaking them. Now we wait for bloom, the phase during which the grapes are pollinated, and much warmer weather. 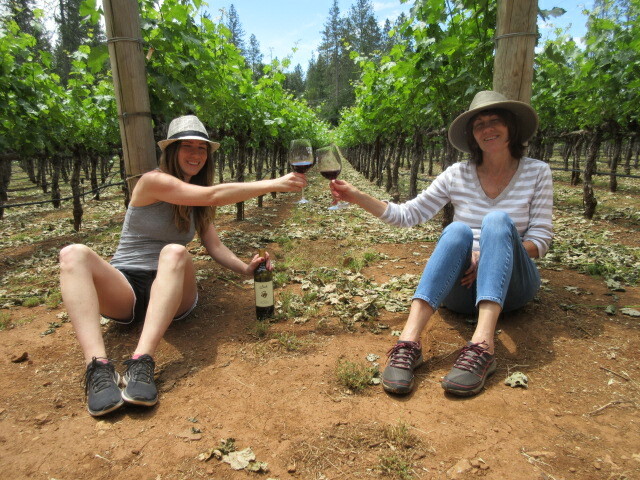 We plan to release our 3 new Howell Mountain wines in late fall, including our 2013 Cabernet Sauvignon made from our vineyard. Bob blended that wine last August and it’s aging in the bottle along with our first Howell Mountain Zinfandel and our second Cabernet Franc. In the meantime, we have some 2014 Napa Valley Zinfandel remaining for sale on our website. Although it’s normally too hot to ground ship wine in summer, we have a safe alternative. FedEx is offering “cold chain” shipping to some locations. It’s temperature controlled ground shipping. Happy Summer.